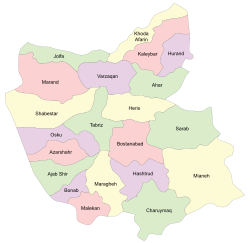 The counties of Iran, called shahrestan (Persian: شهرستان‎ šahrestân), are administrative divisions of larger provinces (ostan). The word shahrestan comes from the Persian words šahr ("city, town") and stân ("province, state"). 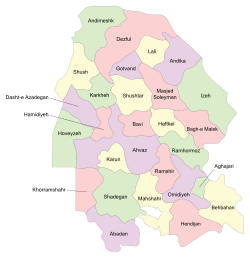 "County", therefore, is a near equivalent to shahrestan. Iranian counties are divided into one or more baxš (بخش), or districts. A typical county includes both cities (شهر šahr) and rural agglomerations (دهستان dehestân), which are groupings of adjacent villages. One city within the county serves as the capital of that county. Each county is governed by an office known as farmandari, which coordinates different public events and agencies and is headed by a farmandar, the governor of the county and the highest-ranking official in the division. Among the provinces of Iran, Fars has the highest number of shahrestans (23), while Qom uniquely has only one, being coextensive with its namesake county. In 2005, Iran had 324 shahrestans. To better understand these subdivisions, the following table is useful. Assume that province P is divided into two counties: A and B. County A has 3 districts: Central, X, and Y. The Central district is the district that contains City M, the capital of the county. Each district contains one or more cities and/or one or more RAs (rural agglomerations). In our example, the Central district contains City M, City N, and RA T, which is composed of the villages V1, V2, V3, and V4; district X contains City O and RA U; and district Y has no cities and one RA V. The minimal county consists of only one city as the only district, named Central. The county B in the following table is of such type, containing only one city Q.